Deliver high-quality classroom presentations with fewer shadows using this 2,600-lumen projector from the world’s leading projector manufacturer. The EB-470 projects a large image from a very short distance thanks to its ultra-short-throw capabilities. Saving valuable teaching time, the projector is fast and easy to set up and use. Horizontal keystone correction enables straightforward picture alignment, while plug and play USB functionality plus a built-in 16W speaker means one cable is all that’s needed for image, sound and page up-down control. The projector can be turned on and off from a wall switch using the direct power on/off function, and with quick-start and instant-off functions, no warm-up or cool-down time is needed. 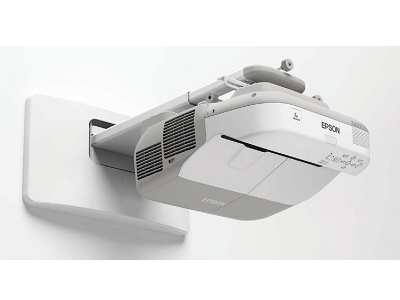 For convenient wall-mounted control at the front of the classroom, the projector can be connected to the Epson ELPCB01 Control and Connection Box. Helping budgets go further, running costs are kept low with the long lamp life of 4,000 hours, or four years2, in eco mode, and 5,000-hour filter life. Epson’s 3LCD technology ensures high-quality images with its equally high White and Colour Light Output for vivid, natural colours and deep blacks, even in daylight. Presentations can be made more engaging by plugging in the Epson ELPDC06 USB Visualiser to show 3D objects close-up, or by using the HDMI input to display high-definition content.